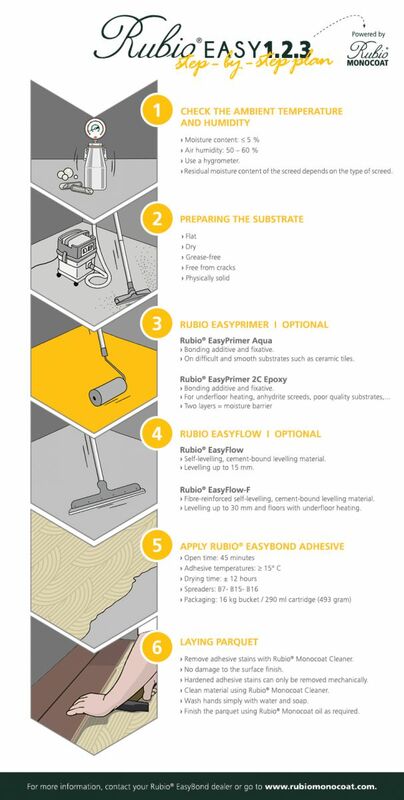 Rubio Monocoat is proudly introducing the newest member of its family, Rubio Easybond. Rubio Easybond is a new generation of single component parquet adhesive based on silane-polymer technology. This parquet adhesive is universally applicable for nearly all types of wood and situations, and contains no plasticizers and is hard-elastic – two characteristics that result in a durable parquet adhesive, which fulfils virtually all recognised norms and tests, including the latest ISO 17178 standard.